I can’t believe Thanksgiving is next week! I love this time of year. We’re looking forward to getting together with family and friends as always. However, life gets so busy during this season. There’s shopping for gifts, parties, activities, travel and holiday shows – It’s all so much fun, but it can all feel overwhelming if I don’t take the time to plan and keep meals simple. We don’t want to eat out most nights, which is what happens if I try to wing it. Plus, making dinners allows for leftovers for at least a couple of lunches each week. At the end of the day, as Anna highlighted in her most recent post what you eat for dinner isn’t what’s most important. It’s the meaningful time you spend connecting with your family. 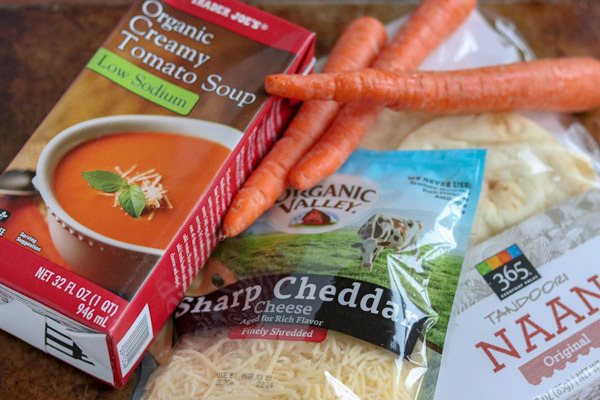 Here are 3 quick and easy meal ideas you can rely on through the holiday season. I’m also going to use Anna’s printable meal planning template (sign up at the top of our blog to receive it) along with a couple of other go-to meals I wrote about last spring to simplify meals. I tend to buy this Neiman Ranch Sweet Italian Sausage. All four of us really like it. 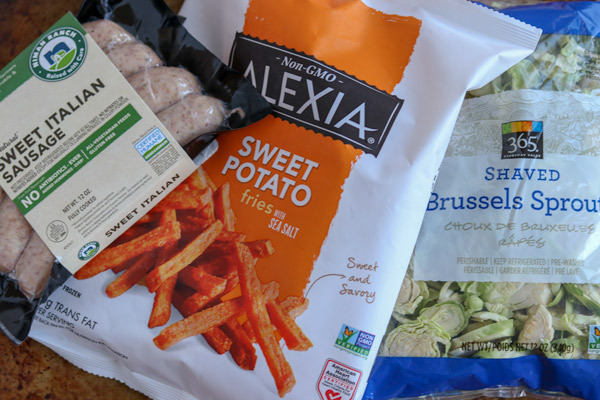 If it’s a vegetarian option you’re after, the Field and Stream sausages are quite good. 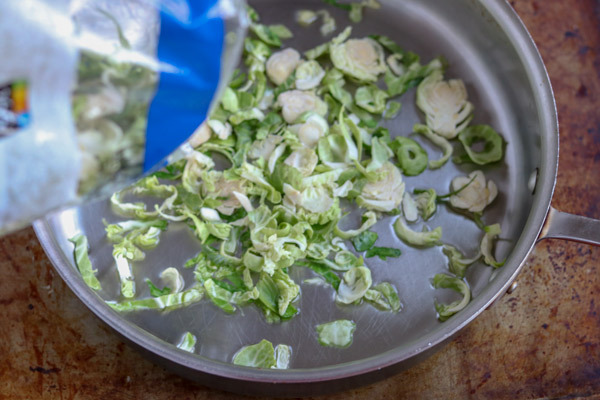 Shaved or shredded Brussels sprouts are a favorite in our house. Everyone loves them, there’s no prep work and they cook in less than 10 minutes! When I can’t find shredded Brussels sprouts, I buy them whole and run them through my food processor with the grater blade. If I know I don’t have time for that extra step, I’ll cook a frozen vegetable I have on hand. 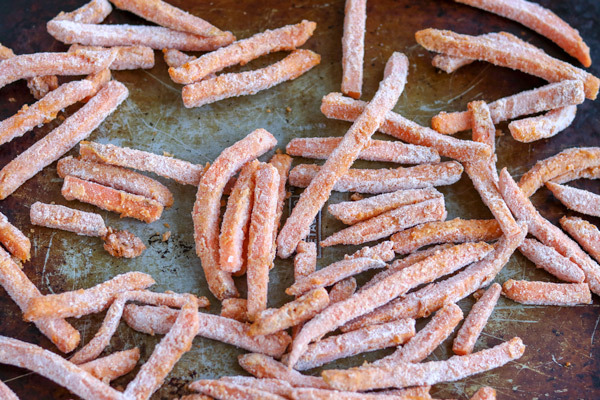 Preheat the oven to 400° F. Place the sweet potato fries on a sheet pan and add a little salt and pepper. Place the pan of sweet potato fries in the oven and cook for about 25 minutes. If your family has some older kids or teens, you’ll likely want to cook 1 ½ – 2 bags of these. 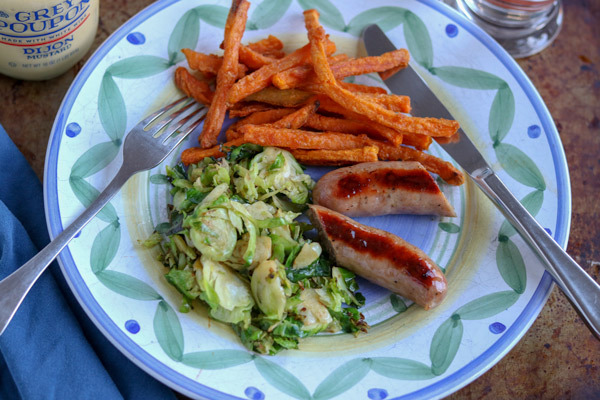 While the sweet potato fries are roasting, put 1-2 teaspoons olive oil in a sauté pan over medium to medium high heat. 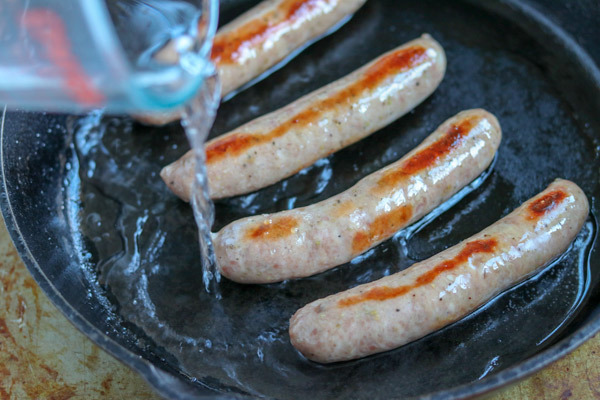 Cook the sausages for 5-7 minutes or until they’re browned. Next add ½ cup water to the pan and place a lid on it. Let the sausages cook for 3-5 minutes while the liquid simmers. Remove the lid from the pan and let simmer a few more minutes. Once most of the water has evaporated, turn off the heat under the pan. Next add 1 TBS olive oil to a large sauté pan over medium heat. Add the shredded Brussels sprouts and toss them with the olive oil. Add salt and pepper to taste and stir. 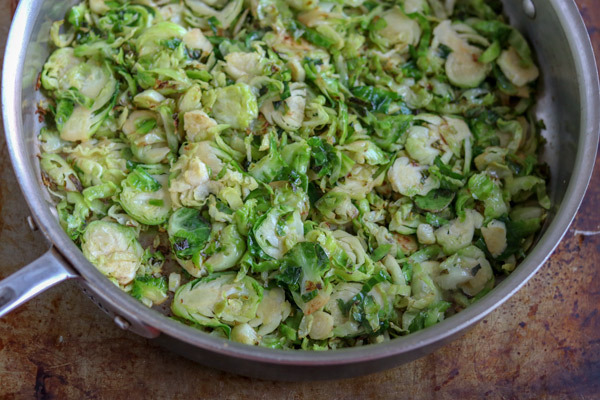 Sauté for 5-7 minutes or until the Brussels sprouts have turned bright green. Dinner is done in 30 minutes! If you opt for a side like pre-cooked, frozen rice or cous cous, dinner is done in 20 minutes! 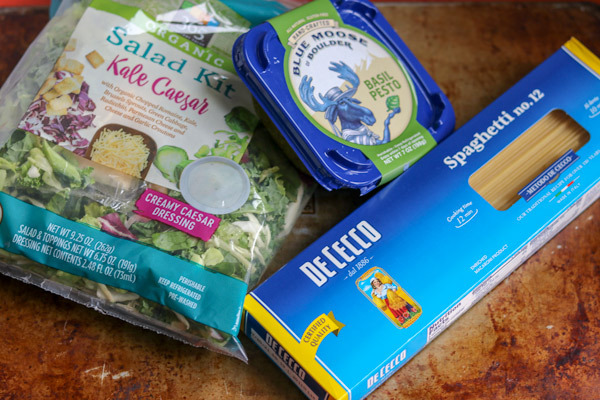 This was the first time I tried this brand of pesto – Blue Moose. I usually buy Bear Pond Basil Pesto or Costco’s Kirkland Basil Pesto, but I decided I’d try something new. It got the thumbs up in our house! Bring a pot of salted water to a boil. 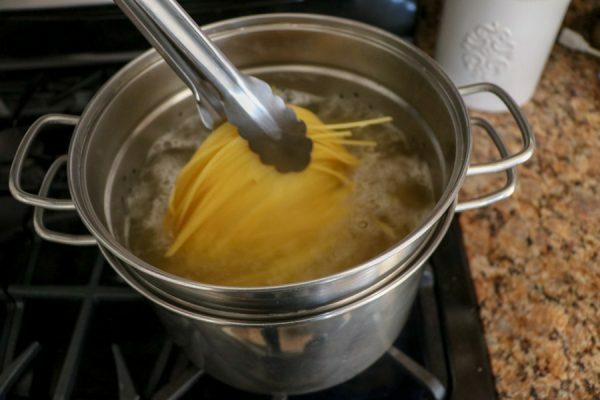 Empty the contents of a box of pasta (any shape you like) into the boiling water. Give it a good stir so the pasta doesn’t stick together. Follow the manufacturer’s direction for cooking time. 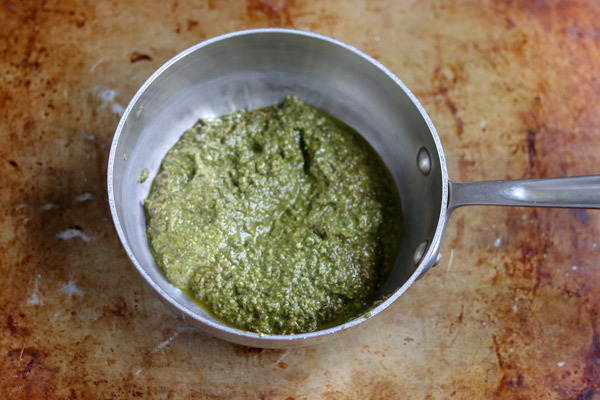 When the pasta is almost cooked, place all the pesto in a pan over medium heat. Once it comes to a simmer, cook for 2-3 more minutes. Then stir the pesto together with the cooked pasta. 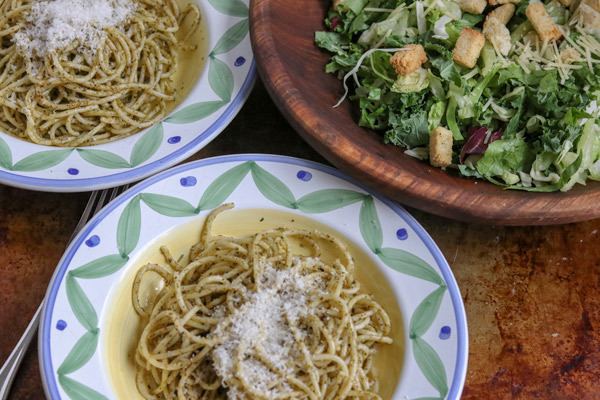 It’s fine to just add the cold pesto to the pasta, but it will cool down the pasta. I love pasta with basil pesto at any temperature, but when it’s cold outside I prefer it heated. Pour the contents of the salad kit into a bowl. Add dressing. And voila! Dinner is done! Like Anna, I encourage clients to aim for protein, carbohydrate and a fruit or veggie when putting together meals. In our house, we like to have plain pasta pesto with a salad and bread, so there’s not much protein here. There are times you’ll make or buy meals that don’t include all the components. And that’s OK! Thankfully, our bodies are fascinatingly complex and will give us signals that we need more of a nutrient we might not have had much of over a day or two. If you’d like the meal to be more substantial you can add cooked chicken or cooked shrimp to the pesto pasta. 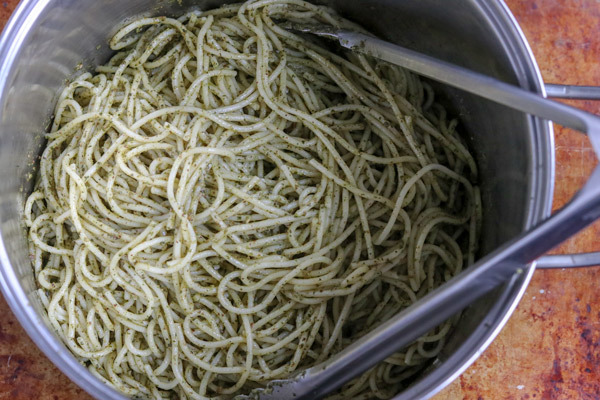 For vegetarians, you could add some canned, rinsed white beans to the pesto pasta. 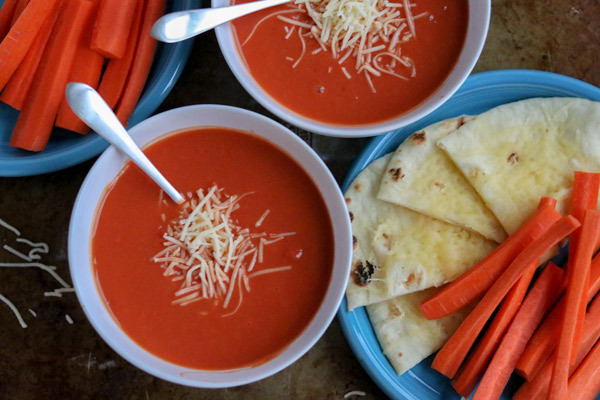 Soup with cheese toast (or Naan) and carrots and dressing (or a crudités tray as Anna suggested here). 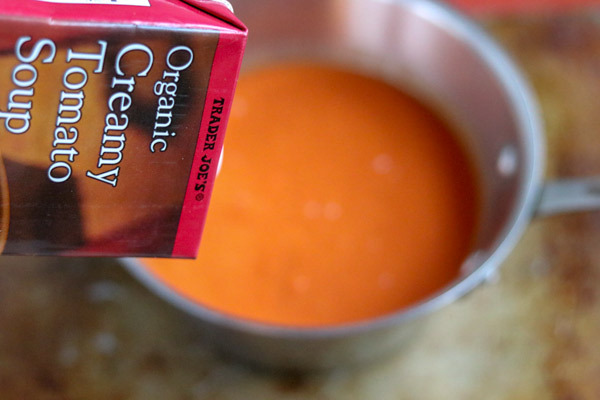 I really like this Trader Joe’s Cream of Tomato Soup! It’s nice and creamy without being too rich. Pour the soup into a medium size saucepan over medium high heat. Bring the soup to a gentle boil and cook for at least 2 minutes. 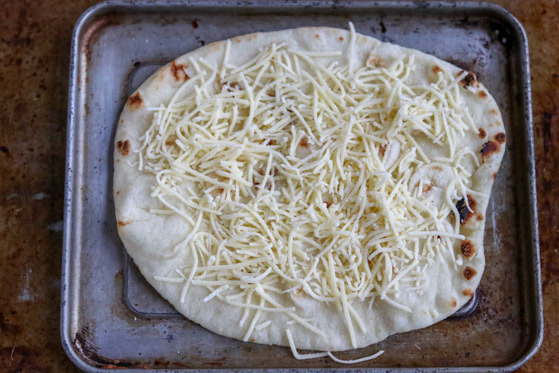 While the soup is heating, sprinkle the grated cheese on the bread (we love to use this Naan at our house) and place on a mini sheet pan that fits in your toaster oven. If you don’t have a toaster oven, simply place the bread on a half sheet pan or a piece of aluminum foil. 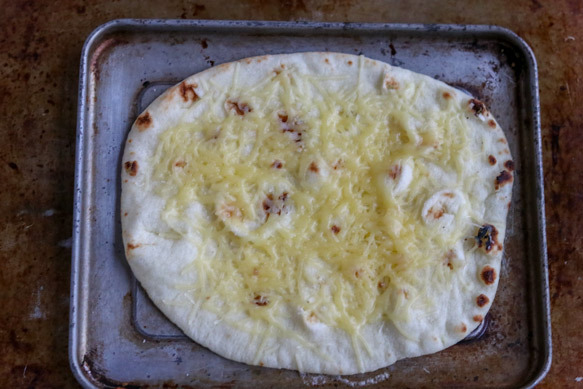 Then place it in a 425 F preheated oven for 5-7 minutes or until the cheese is melted. Make 1-2 pieces of cheese toast per person depending on the size and type of bread. I love Anna’s suggestion of buying crudités trays as a simple side for dinners and plan to add that to my own list of go-to sides! 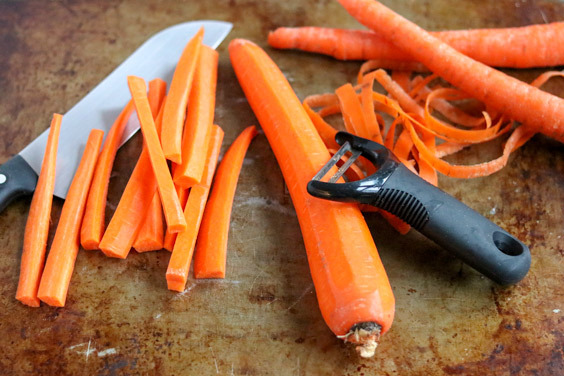 I often use baby carrots or if I feel like it, I peel (my favorite peeler ever pictured here) and cut carrots and serve them with a side of dressing for dipping. All 3 of these meals take 30 minutes or less! Ordering take out is a great tool during busy times, and it’s nice to have go-to meals like these as an option, too. We’d love to hear from you! What are your favorite go-to meals! *This post contains affiliate links. We are part of the Amazon Affiliates program.